Tempered glass is one of the most popular choices for applications in which traditional, or annealed, glass may pose a safety hazard. For nearly 100 years, Swift Glass has been providing quality custom glass fabrication services for a wide range of industries. 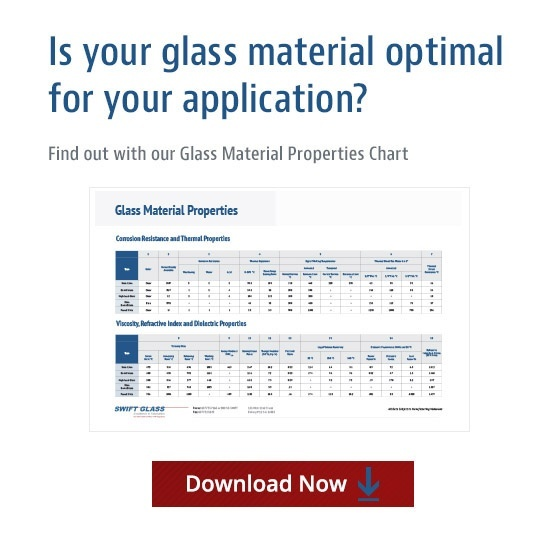 To provide insight on the thermal glass tempering process and its various benefits, our experts have provided answers to some of the most common questions we field here. Is thermal glass tempering the same as chemical strengthening? Tempered glass undergoes an intense heating process immediately followed by rapid cooling. The extreme temperature shift causes the glass surface and edges to compress, creating an extremely tough outer surface with a tensioned glass core. Material properties are enhanced, making the glass as much as five times stronger. In contrast, chemical strengthening — also known as ion exchange — treats glass by submerging it in a molten potassium salt bath, causing sodium ions in the glass to be replaced by potassium ions from the bath. The potassium ions, which are larger than the sodium ions, squeeze themselves into the gaps left by the smaller sodium ions when migrating to the potassium solution. The surface of the glass is then in a state of compression while the core is compensating tension. Both of these glass-strengthening methods alter the outer surface of the glass, causing it to have a higher compression than the interior glass, which is in a state of tension. Depending on the specific application, each process offers unique advantages for a material’s final composition. Can you thermally temper quartz? Because of the high optical and thermal properties of quartz compared with other types of glass in their natural state, quartz cannot be tempered. What glass materials can you temper? Will tempered glass always shatter into tiny pieces? Not always. It depends on the material. The chemical makeup of different types of glass determines whether the glass will break into small, smooth pieces or sharp, jagged edges. For example, soda lime glass always breaks into small pieces unless it has been subject to temperatures above 450 °F. When glass is subject to temperatures above this point, the glass begins to weaken and returns to the annealed state. Once this happens, the glass will break into shards. Materials such as borosilicate, on the other hand, will not necessarily break into tiny pieces when tempered. What is the largest size piece of glass you can temper? The thickness of a piece of glass will determine the size you can temper. At Swift Glass, we can temper glass at 34 inches x 72 inches for pieces up to 1 inch thick. For glass pieces with a thickness up to 2 3/8 inches, we can temper up to a size of 14 inches x 14 inches. What is the thinnest glass you can fully temper? Where is tempered glass used? The tempering process changes the composition of the glass, giving it strength, durability, and scratch-resistance. Tempering allows thin glass to withstand harsh environmental conditions without losing its functionality.